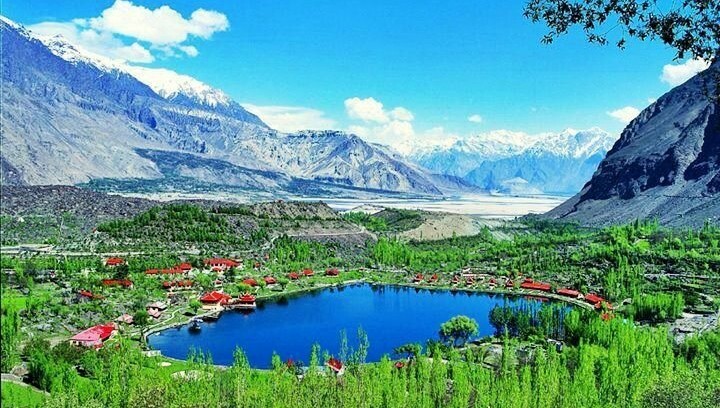 Skardu, capital of Baltistan is perched 2,438 meters above sea level in the backdrop of the great peaks of the Karakoram. Balti people are a mixture of Tibetan and Caucasian stock and speak Baltic, an ancient form of Tibetan. Due to the similarity of its culture, lifestyle and architecture with Tibet, Baltistan is also known as the "Tibet-e-Khurd" (Little Tibet). Apart from its incomparable cluster of mountain peaks and glaciers Baltistan's five valleys - Shigar, Skardu, Khaplu, Rondu and Kharmang are also noted for their luscious peaches, apricots, apples and pears. The Deosai National Park is located in the Skardu District of Gilgit-Baltistan province. Deosai means 'the land of Giants'. The park is located on the Deosai Plains of the Gilgit Baltistan geographic region. Deosai is a tourist attraction and many tourists who visit Baltistan go to Deosai as well. Deosai Plateau is the second highest plateau in the world after the ChangTang in Tibet. The Deosai National Park was established in 1993 to protect the survival of the Himalayan Brown Bear and its habitat.